(CNN) -- A close aide to Pakistan's Taliban chief Baitullah Mehsud said he is breaking ties with him and confirmed reports that Mehsud was behind the assassination of former Prime Minister Benazir Bhutto. 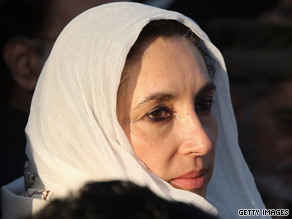 Former Pakistan Prime Minister Benazir Bhutto was assassinated in December 2007 at a campaign rally. Qari Turkestan Bhitaini, a self-proclaimed right-hand man of Mehsud, said Mehsud was behind the December 27, 2007, assassination of Bhutto, Pakistan's Express TV reported. Bhitaini said he is breaking ties with Mehsud because he blames the Taliban chief for killing scores of innocent Muslims in recent attacks in Lahore. The Pakistani government and CIA officials have said in the past that Mehsud was responsible for Bhutto's death. Bhutto, 54, was heading the opposition to then-President Pervez Musharraf when she was assassinated during a campaign rally in Rawalpindi ahead of parliamentary elections. The Pakistani government, who has struggled to control terrorism, is waging a military offensive against the Taliban in the country's North West Frontier Province.